Literally every open procedure performed upon the kidney has now been done laparoscopically. Procedures include the following: pyeloplasty, partial nephrectomy for malignancy, partial nephrectomy for duplication anomalies, partial nephrectomy for fusion anomalies, lower pole partial nephrectomy for stones, ureterocalicostomy, pyelolithotomy, anatrophic nephrolithotomy, pyelocaliceal diverticulectomy, renovascular surgery, autotransplant, donor transplantation, and nephropexy. Here, the literature will be viewed from the standpoint of the laparoscopic reconstruction efforts. Attention will be particularly paid to those methods that the investigators are utilizing to repair the genitourinary tract, and their postoperative management and outcomes. FIGURE 1 ■ Laparoscopic pyeloplasty. presenting with ureteropelvic junction obstruction. Others argue that less invasive endopyelotomy approaches remain viable alternatives in selected patients with a high probability of success. Markovich et al. (4) recently reported on trends from 37 endourologists in North America. They found that 41% were still performing endopyelotomy, 51% were performing laparoscopic pyeloplasty, and about 50% were still performing open pyeloplasty. Of note, about 20% of those polled would now choose a laparoscopic pyeloplasty as first-line therapy (5). A single institution's comparison of laparoscopic pyeloplasty, Acucise endopyelotomy, and open pyeloplasty showed success rates of 94%, 54%, and 86%, respectively (6). It is easy to understand that the trend among endourologists is to consider laparoscopic pyeloplasty as first-line therapy. Schuessler has reported his first six cases of laparoscopic dismembered pyelo-plasty (6). All were performed with running 4-0 polyglactin sutures, two had reduction pyeloplasties, and all were drained postoperatively. He has subsequently reported upon six additional cases with operative times ranging from 180 to 420 minutes. Two additional laparoscopic pyeloplasties are reported using a 4-0 absorbable suture material. The largest single series has come from Johns Hopkins with 100 reported cases. Seventy-one of these 100 cases were Anderson-Hynes-dismembered pyeloplasties with sutured reconstruction. Their average operative time was 252 minutes (range, 120-480 minutes). The success rate is reported to be 96% at a mean follow-up of 32.4 months (7). Gaur et al. (8) described eight patients who underwent laparoscopic pyelolithotomy without closure of the pyelotomy incision (9). They have subsequently described a homemade intracorporeal suturing instrument to solve the problem of open drainage in order to reconstruct the pyelotomy. Laparoscopic pyeloplasty has also been utilized to synchronously extract calculi and repair the obstructed ureteropelvic junction. In the single largest cohort, 19 patients with 20 renal units underwent simultaneous interventions. Varying methods of laparoscopic reconstruction were used including the Anderson-Hynes, Y-V plasty, and Heineke-Mikulicz. Stone free status was 90% (17/19) and 90% had no obstruction at three months follow-up. Two of these patients have recurrent stones at follow-up for an 80% stone free rate (16/20) (10). Laparoscopic pyeloplasty has been evaluated for the treatment of secondary ureteropelvic junction obstructions (11). In a multi-institutional evaluation of 36 patients with an average of 1.3 prior procedures (range 1-4), the reported patency rate for a laparoscopic pyeloplasty is 89% and the reasonable objective response was 94% (11). In addition to salvage for secondary ureteropelvic junction, other reconstructive urologic procedures may be necessary in patients that have had previous surgery and long segmental defects affecting the ureteropelvic junction. Kaouk et al. reported the use of a dismembered tabularized flap repair in a 73 years old lady with a solitary kidney who had failed multiple prior procedures (12). In addition, a laparoscopic ileal ureter reconstruction was described by the same group from the Cleveland Clinic. An 87 years old with a solitary left kidney had a solitary proximal ureteral tumor and underwent a total ureterectomy and an ileal ureteral interposition (13). One recent review used a decision tree analysis to compare the costs of each method of ureteropelvic junction repair at a single institution (14). A retrograde ureteroscopic endopyelotomy was the least costly (US$3842). The Acucise endopyelotomy was next (US$4427) followed by antegrade endopyelotomy (US$5297), laparoscopic pyeloplasty (US$7026) and open pyeloplasty (US$7119) (14). The authors are quick to point out that the financial data are arbitrary to the decision, but in the current Health Care environment the failure to consider this is likewise unacceptable. In conclusion, patients with uretero-pelvic junction obstructions, especially with crossing vessels, are increasingly being considered for laparoscopic pyeloplasty. The success of this operation is very good, rivaling those of its open alternative. The method of choice for the repair has yet to be answered, however, for patients with crossing vessels, the Anderson-Hynes-dismembered pyelo-plasty appears to be the most reliable method with intracorporeally sutured anastomosis. FIGURE2 ■ Laparoscopic partial nephrectomy. As every other aspect of open renal surgery has been reproduced laparoscopically, it is important to consider the reconstructive aspects of partial nephrectomy (Fig. 2). Partial nephrectomies were previously anecdotal, now a MedLine™ search shows greater than 56 published articles on this primarily. Most partial nephrectomies are performed for malignancy. The largest series was reported at the 2003 American Urologic Association Meeting by Gill et al. They compared laparoscopic and open partial nephrectomies in 200 consecutive patients. Pyelocaliceal repair was performed in 63.9% of the laparoscopic cases versus 73.4% of the open cases (p = 0.20). Pyelocaliceal repair was performed utilizing suture-ligation of intrarenal vessels and renal parenchymal reconstruction (15). Another recent investigation of pure laparoscopic versus laparo-scopic-assisted partial nephrectomy in a porcine animal model noted that surgeons rated suture placement and tying much easier in the pure laparoscopic technique over the assisted alternative (16). Most investigators have taken to covering their sutured repair with fibrin glue or modification with a Surgicel patch (fibrin glue-impregnated patch). A flap of extrarenal fat can likewise be swung and sutured for a layered covering. In addition, many papers reviewed also utilized stenting judiciously in order to decrease the risk of urinary leakage (17,18). Two small series of investigations utilizing this technique have been reported, both in swine models. Cherullo et al. performed a laparoscopic lower pole nephrectomy by transverse amputation in 10 pigs. Next, a sutured ureterocalicostomy was carried out with interrupted absorbable sutures. All anastomoses were stented and the mean operative time was 165.3 minutes (range, 105-240 minutes) (19). The group at University of California Irvine is likewise investigating this complex reconstruction utilizing a similar porcine model but with a unique reconstructive twist. A novel nitinol tacker has been used for vascular anastomoses. Because previous reports by this same group have revealed little lithogenic potential for titanium during the use of an Endo-GlA™ for reduction of the renal pelvis during laparoscopic pyeloplasty, this device deserves further attention (20,21). Anatrophic nephrolithotomy has been the last bastion of open renal stone surgery (22). This has now been modeled in the porcine surgical research lab and brought into clinical practice at the Cleveland Clinic. Laparoscopic anatrophic nephrolithotomy was performed in 10 pigs and 11 kidneys using vascular pedicle clamping, contact surface kidney cooling, renal parenchymal incision laterally along the avascular plane, and sutured reconstruction. This group has reported upon the clinical application of this technique in two patients (23). Coupled with the methods of laparoscopic, intraoperative ultrasonography, it might be expected to expand to other applications such as the radial nephrotomy for obstructed calyces. Renal vascular surgery can be performed for nascent renovascular disease or during the reconstruction phase of renal transplantation and autotransplantation. In the former category, nascient renovascular disease, laparoscopic repair would of course have to compete with the less invasive alternative of percutaneous transluminal balloon catheter angioplasty with renal artery stenting (24). The Cleveland group has also evaluated laparoscopic renovascular reconstruction. In their preliminary animal series, five female swine underwent a seven-step renal artery repair (25). 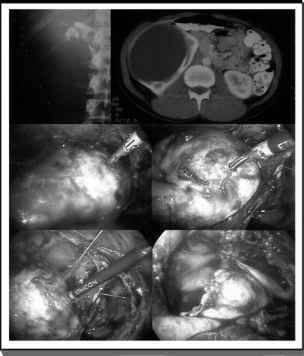 This group followed with a case report of a laparoscopic repair of a 3 cm sacular left renal artery aneurysm in a 57-year-old woman. A four-port transabdominal technique was utilized allowing circumferential mobilization, Roummel tourniqueting of the main renal artery, bivalving of the aneurysm with excision, followed by 4-0 polypropylene sutured repair using an RB-1 needle. Total repair time was 31 minutes with an approximate 100 cc blood loss (26). Splenorenal bypass is another method for managing renal artery stenosis. This has been investigated in a canine model of six animals. In this laboratory model a spatulated, end-to-end anastomosis of the renal to the splenic artery was accomplished using 6-0 polypropylene sutures on an RB-2 needle. Mean anastomotic time was 71 minutes (SD = 8 minutes) (27). More distal vascular aneurysms are also approachable laparoscopically. This same group recently reported a 51-year-old male with a multilobulated intrarenal aneurysm from the upper pole branch of the renal artery. Laparoscopic Statinsky clamping controlled the renal hilum en bloc, the aneurysm was circumferentially mobilized, clipped and divided. They completed this using four ports with a total warm ischemia time of 39 minutes (28). Ming et al. have performed laparoscopic-assisted autotransplantation in patients with devastating ureteral and ureteropelvic junction injuries. The kidney is mobilized in much the same manner for a donor nephrectomy only a small separate lower quadrant incision is made for the autotransplant. Finally, the ultimate vascular reconstruction has been a robotic-assisted kidney transplantation where all anastomoses, both vascular and ureterovesical have been performed with the aid of the daVinci™ robot (29). Gluckman first reported a laparoscopic ablation of a pyelocaliceal diverticulum by unroofing and ablation, but little was mentioned in the way of reconstruction (30). Two separate reports of pyelocaliceal diverticula ablations have been reported (31,32). In both cases, the anterior diverticula were incised and the linings marsupialized and fulgurated. Omentum was used in the first case and the colon in the second to isolate and cover the exposed raw surfaces. Since then, there have continued anecdotal reports of a case and one published small series representing five cases with detailed description of technique. In this series, a vertical incision was made over the thinnest avascular plane over the diverticulum. All stones or stone debris is removed into an endoscopic sack. Figure-of-8 3-0 polyglactin sutures were used to obliterate the ostium. An argon beam coagulator was used to obliterate the epithelial lining after thorough inspection to insure no inadvertent malignancies. Adjacent perirenal fat is mobilized and sutured into the diverticular defect. A Jackson-Pratt drain is placed prior to exiting. Stents were utilized routinely (32). A final series of four cases has been recently described on the management of type II pyelocaliceal diverticula (Fig. 3). Two of these four patients underwent laparoscopic repair in a similar fashion to that reported by Miller with excellent outcomes and functional recovery of the kidneys (33). Nephroptosis and the "floating kidney" are most commonly identified in thin, young females and preferentially involve the right side. It has an uncertain incidence in the modern era, but the correction of this condition resulted in large series published in the early modern surgical literature (34). With the advent of laparoscopic techniques, it is certainly possible to provide surgical fixation to these "floating kidneys." Urban first reported a laparoscopic nephropexy in 1993 using clip fixation techniques (35). Elashry et al. presented a group of six patients who underwent two methods of laparoscopic nephropexy: transperitoneal (4) and retroperitoneal (2). The nephropexy was performed using a vertical and horizontal row of 1-0 silk sutures through the renal capsule into the quadratus lumborum fascia. Mean operative time was four hours (range, 2.5-7 hours) (36). Larger series with longer follow-up is now available. Plas et al. (37) presented 30 patients who have had a transabdominal laparoscopic nephropexy since 1992; 17/30 have been followed for greater than five years and all are asymptomatic. In 10 completely evaluated patients, 8 have no nephroptosis but 2 (20%) have greater than 5 cm displacement. Their technique is decidedly different than the Washington University series. They describe fixation using a polypropylene mesh shaped like an ellipse to cover the sagittal aspect of the kidney during active cephalad displacement. Fascial staples are used to fix the mesh to the abdominal wall from the upper pole to the lower. The average operating time was 154 minutes (range 90-300 minutes) (37). A final series comes from Lubeck, reporting transperitoneal laparoscopic nephropexy in 22 women and 1 man. A round-bodied double-stranded No. 2 nonabsorbable polyester suture was passed via the abdominal wall and used to fixate the upper pole to the psoas or quadratus lumborum with a single simple stitch. A second suture is made to fix the convexity of the kidney laterally. They compared this procedure to 12 open nephropexies performed at their hospital showing previously. FIGURE3 ■ Laparoscopic type II pyelocaliceal diverticulum. The mean operative time was 61 minutes (40-85) laparoscopic versus 49 minutes (28-70) for open nephropexy. Narcotic use, complications, hospital stay, and mean days to return to work all favored the laparoscopic approach. All patient in this series had correction of the nephroptosis by intravenous pyelogram at six weeks. There appears no definite method that reliably fixes the kidneys from these series, but the historical literature is replete with methods of renal fixation, well over 170 operative techniques. Szekely recently reported in a letter to the editor of the "Journal of Urology" that the same thing could be accomplished by placing a circle (U) nephrostomy tube for two weeks (38).